In this guide, we're going to explore the different settings you can choose for an individual song in Synthesia. This may be necessary when working with songs you found elsewhere or created yourself. 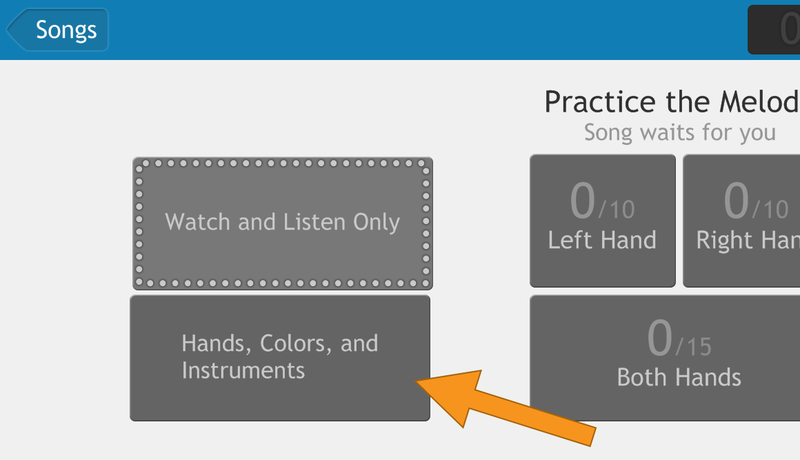 On the Song Settings screen, choose "Hands, Colors, and Instruments." From the Hands, Colors, and Instruments screen, there are several customizable settings, detailed below. To customize the instrument for each Part of the song, select the instrument in one of the boxes (we will be referring to the boxes as "Parts" through the remainder of the guide). 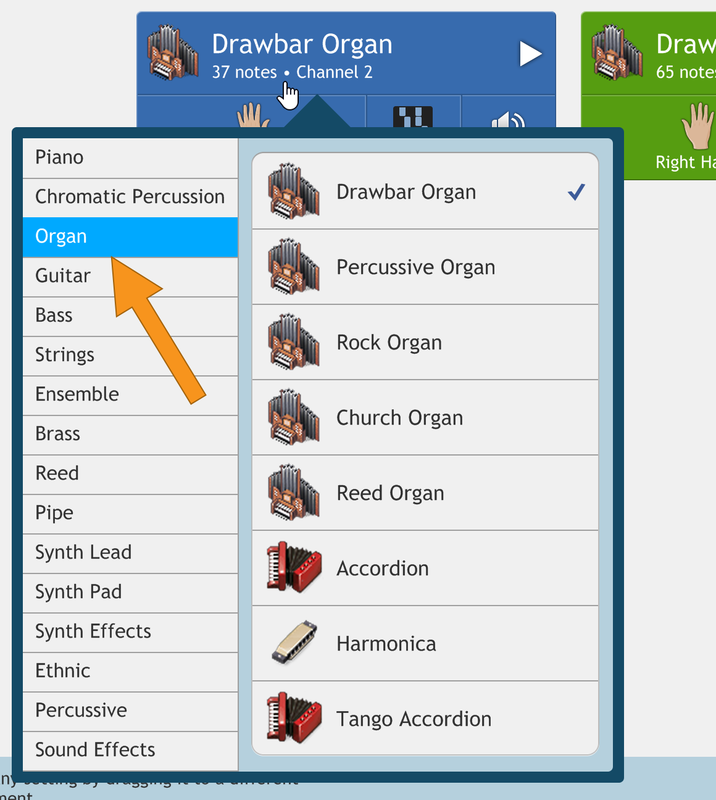 You can click or tap the text or the icon itself to open the instrument menu which provides a list of available instrument categories. Selecting an instrument from the left menu reveals the available instruments in each category. Clicking the "Play" button will play a preview sound of each instrument. The "Play" button will remain active and continue to provide sound previews until you click the "Pause" button, even as you switch between instruments. To set your desired interaction with a given Part, choose the "Hand" icon. Selecting either the Left or Right hand will make the instrument part eligible for you to practice or play. Selecting the Background option instructs Synthesia to play this Part for you. For details on the Custom option, please see the assigning hands guide. Once you have selected a desired mode of interaction, clicking or tapping the "Color" icon will allow you to assign a color to that mode of interaction. 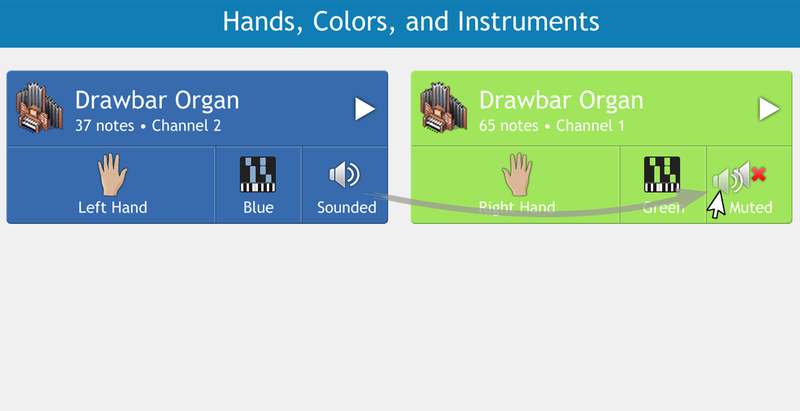 You can set a different color for each interaction choice, and Synthesia will remember those selections for you. By default, choosing the Background option will select "Hidden" for the color. If you would like to see the notes for a Part that you have Synthesia playing for you in the background, you can change its color here. Selecting the bottom option (Hidden) will prevent this Part from displaying any notes at all. Used in combination with either the Left or Right hand, this selection can make for especially challenging practice! 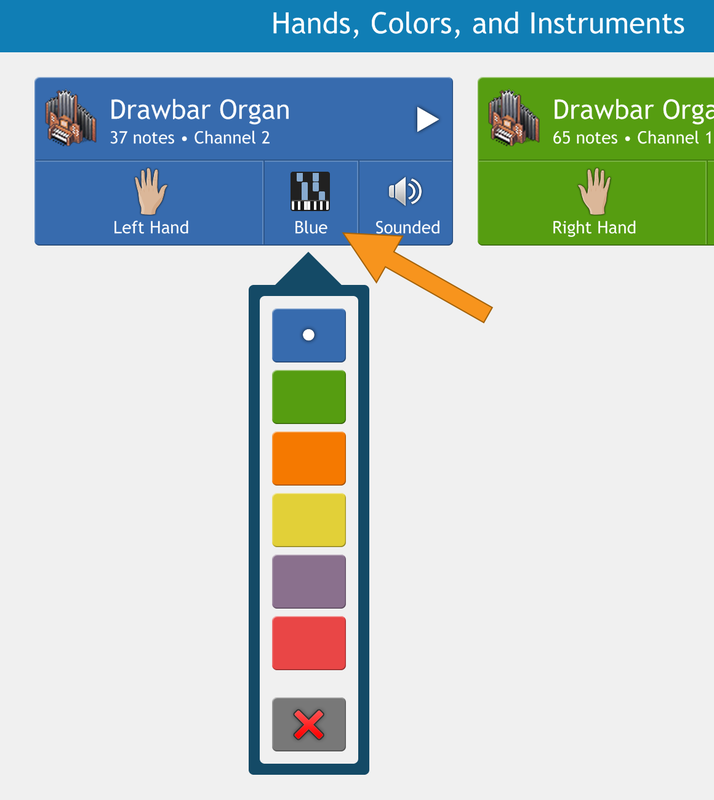 The "Sounded" button allows you to turn off the audio playback for notes played with an individual hand. When you have turned the sound off for a particular hand, the button will read muted. 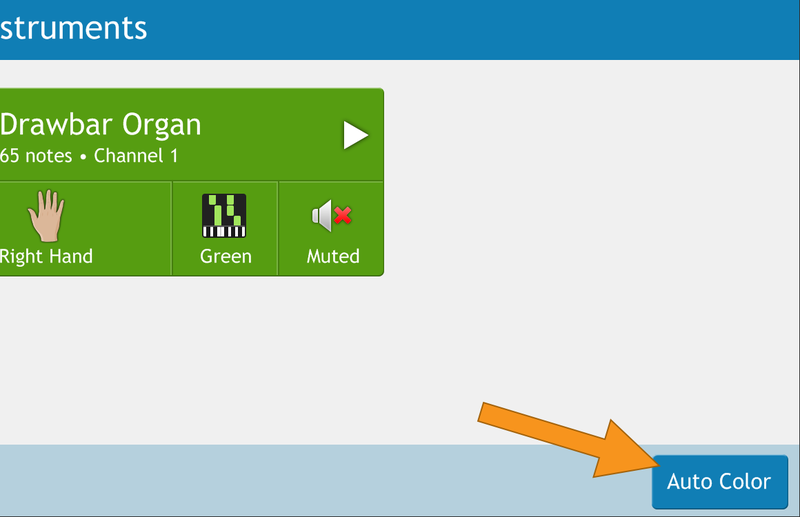 Tapping or clicking will toggle this button between sounded and muted. Unless you've also set the Hand or Color settings to Hidden, you will still see the notes for the hand, even when the sound is set to Muted. You can quickly duplicate settings to other Parts by dragging them from one part to another. To apply a setting to all Parts, begin dragging the desired setting. You will see an "All Parts" button appear at the bottom center of your screen. Drop the desired setting on "All Parts." The "All Parts" button only appears once you start to drag a setting. To reset a particular Part's settings to the default, simply drag the lightning bolt icon over the Part. This resets all instrument, hands, color and sound for that Part. You can also drag Reset to "All Parts" (which appears in the lower center of your screen when you begin to drag) to reset all settings for all Parts. 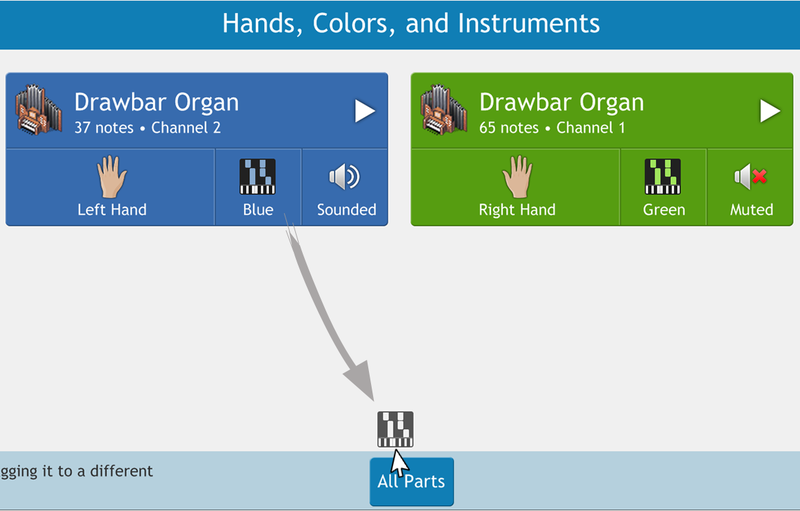 The "Auto Color" button sets all left hand parts that you've assigned to blue and all right hand Parts to green. It also hides any Parts set to Background. If you have not assigned any hands, using "Auto Color" will cause all Parts to revert to their default colors. Once you've assigned your desired settings for the song, clicking or tapping the back button will take you back to the Song Settings screen. Your settings for that song are now saved. 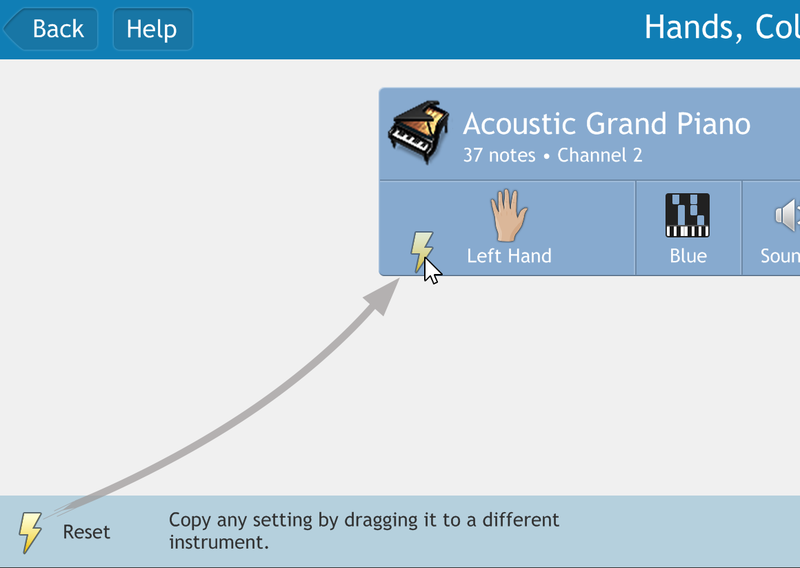 Should you need to refer back to this guide, you can always access it by selecting the "Help" button at the top left of the Hands, Colors and Instruments screen.